While I continue to work on Stench of the Sea, I have tinkered with ways to create quick and simple maps. Right now, I find I get maximum creativity and quickest results using a Sharpie and a packet of sticky notes. I have some stickies bigger than the ‘standard’ size and some smaller – and, combined, they let me outline an area on the big ones, then zoom in on the small ones. I originally tried posting an encounter and maps drafted out on the page of an old 2010 diary – and posted it over on Google+. Not content, I scanned the page and annotated the copy with a tool called Quick Markup, because I realised I missed out some details. Then, as if I really didn’t have other fish to fry (like finishing Stench), I drafted the whole thing using my previously outlined combination of stickies. I drew up the main map, then the zoom maps, before writing the area details around them and snapping the outcome with my camera. Then, I added additional extended detail on the opposing page with PhotoShop. I like the format. I like the feel of a journal, combined with sketched maps and hand-written content. Completing the extended detail in a handwritten typeface continues the feel without leaving me with terminal writer’s cramp. I’m certain I could manage it, but I’d rather not test the theory. 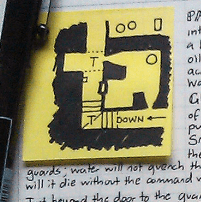 I’m inclined to consider doing a whole supplement of ‘found’ treasure maps in this same format, outlining generic fantasy encounters with maps and maybe some other pictures, too. I could sketch out runes or room features. Maybe a trap outline or an image of a new creature. If people have an interest in this sort of thing, please comment. A whole collection of these would take a lot of time to do, but if the interest exists I’m up to the task. Voltari’s Retreat finds a group of adventurers hired by the wretched inhabitants of a country or state recently at war, but now spent and confused. The people seek revenge upon their one time leader for driving them into a pointless conflict, but he has gone missing and they need the adventurers to find him. The one-pager outlines his hiding place, how he managed to get away, and his plans for avoiding unwanted visitors. While generic, the adventure includes some system reference using the very simple CHIMURA system previously mentioned in this blog and when I outlined Dwarves on Google+.